Palli Karma-Sahayak Foundation (PKSF) has taken a strategic decision to implement the Results Based Monitoring (RBM) System as a part of its regular monitoring process. 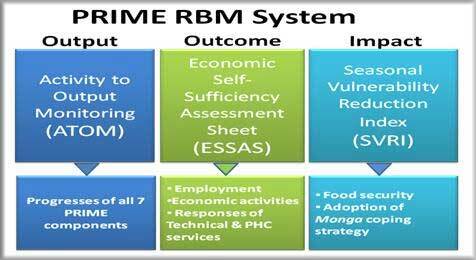 The main objective of implementing the RBM system is to monitor the progress of the desired outcomes of its different programs and projects. PKSF started to implement the RBM system in its PRIME project in 2010. Recently, PKSF has taken initiatives to implement the RBM system in its Community and Climate Change Project (CCCP), Ujjibito Project, Livestock Unit, Agricultural Unit and Microenterprise (ME) program. In due course, PKSF will implement RBM system for its entire program to track the ultimate goals of these programs. PKSF has beenimplementing RBM system in its PRIME project since 2010 to monitor the desired results of the project. The RBM system helps PKSF management to review the activities of PRIME quite early and change them if necessary. RBM system provides information that flags activities which might require immediate management attention. In addition, the system establishes an accountability system by sharing information widely. At output level, the activity to output monitoring (ATOM) system uses time-based, cumulative percentage progress towards overall target for each element of the programme. These progresses are combined at various levels based on weight to give meaningful percentage progress of all components, partners and areas right up to the programme level. At the outcome (purpose) level, the Economic Self-Sufficiency Assessment Sheet (ESSAS) is used to measure the ‘economic self-sufficiency’ of PRIME beneficiaries that will help them fight food insecurity during Monga periods. An assessment sheet is used as a guide to scoring ‘financial maturity’ of households according to three criteria: year-round employment, number of earning members in a household and greater engagement in economic activities of each household.Besides, IGA-related technical know-how and health-awareness of PRIME beneficiaries were also assessed through additional parameters in the same assessment sheetin RBM study from FY 2013. 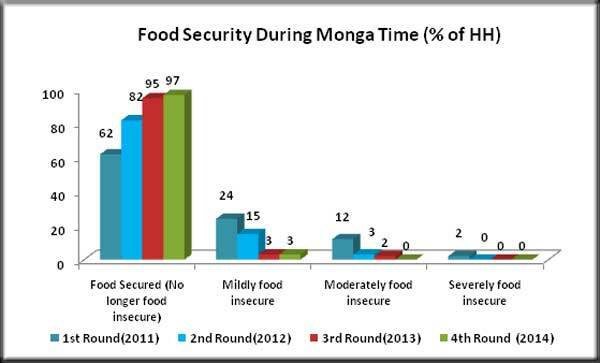 Impact monitoring is done partly with the USAID’s Household Food Insecurity Access Scale (HFIAS)which is being modified partly by introducing the scope of assessment supplementary indicators, and is conducted at the end of the monga season based on previous month data. The top-level index is the Seasonal Vulnerability Reduction Index (SVRI) which is calculated from field data using a SVRI spreadsheet. At the outcome level RBM measures economic self-sufficiency of PRIME participants through measuring mainly their income, employment and level of economic activities. By definition, ESSAS measure economic self-sufficiency of beneficiaries in terms of their year-round employment, number of earning members, income and greater involvement in economic activities. These are the immediate effects of project services e.g., micro finance, capacity building, technical services, IGA implementation, etc. Household Income: Monthly income of PRIME HHs during 2007-08 at baseline and also during FY2011-12, FY2012-13,FY2013-14 and FY2014-15is shown in Figure 2. Household Employment: Employment situation of PRIME households during FY2011-12, FY2012-13,FY2013-14 and FY2014-15Monga periodis shown in Figure 3. Figure 3: Proportion (%) of PRIME households engaged in different period of employment during different Monga period. In the fifth stage of RBM implementation in PRIME, about 6,120 households of 51 PRIME branches have been chosen for collecting primary data to monitor the progress of the PRIME programme participants. The RBM implementation has already been started and it will be continued till January 15, 2016. During the lean period of FY 2014-15, about 97% of PRIME beneficiaries were fully food secure which was 95%,82% and 62% in the previous three fiscal year. During the same period, about 3% of PRIME HHs was mildly food insecure. There was no severely and moderately food insecure household during this period (Figure 5). 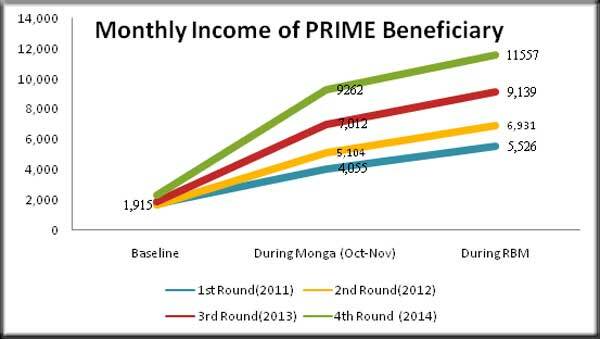 Figure 5: Effect of PRIME on food security condition of PRIME (South) beneficiaries during FY2011-12, FY2012-13, FY2013-14 and FY2014-15 lean period. During FY 2011-12, about 35%monga affected HHs (about 100%) used to adopt one to all types of different monga coping strategies such as – asset sale, advance labour sale, advance crop sale or lending from money lender. However, within FY 2014-15,about 17% of PRIME members required adoption of any monga-coping strategy which wasrespectively 13%,22% and 35% in the previous financial year (FY 2012-13) (Figure 6). Figure 6: Proportion (%) of PRIME member HHs either adopted or do not adopted any monga coping strategy during FY2011-12, FY2012-13, FY2013-14 and FY2014-15. During FY 2014-15, about17% of PRIME HHs adopted different coping strategies namely distress sales, advance labour sales, advance crop sales and borrowing from money lender at the rate of 7%, 0%, 0% and 11%, respectively (Figure 7). Figure 7: PRIME (South) beneficiaries adopted different coping strategies to cope seasonal vulnerability during FY2011-12, FY2012-13, FY2013-14 and FY2014-15. RBM in Community and Climate Change Project (CCCP): The main objective of the CCC project is to enhance the capacity of selected communities to increase their resilience to the impacts of climate change. The CCCP management unit in association with RBM unit has developed the results chain to monitor the climate change impacts of the CCCP. The first round RBM implementation of this project has been completed where around 200 households have been surveyed to monitor the impact of the project. RBM in ME Program: Micro Enterprise is PKSF’s Mainstreamprogramme. PKSF has been implementing ME programme since 2001 with a view to expanding the economic activity of the entrepreneurs so that they can create self-employment for themselves and at the same time can create wage based employment for the poor people of the community. There are two main goals of the ME programme such as economic development and job creation. PKSF will monitor the outcomes of the ME programme i.e. asset creation, employment generation and poverty reduction through RBM. At present PKSF is developing the results chain for the ME programme. The questionnaire of the baseline survey has been drafted. By this year, the research department of PKSF will finalize a strategic plan to implement the RBM in its ME programme. RBM in Ujjibito Project: The EU funded “Food Security 2012 Bangladesh-Ujjibito” project has started its operation from November 2013 to address the incidence of extreme poor which is characterized by insufficient income, poor health, acute malnutrition, illiteracy and a high concentration of wage laborers in the households with limited assets, female-headed households (widows, divorcees), destitute women and large family size. In many instances, the vulnerable households do not have any viable coping strategies and unable to reduce the risk of natural disasters. It works with the objective of sustainable graduation out of rural ultra-poverty through a combination of public safety nets, social and livelihood development support and longer term linkage with micro-finance. To monitor the accessibility of nutrition and healthcare services, reduction of poverty and assess the progress of social development of the programme participants, a plan has been initiated where about 400 households will be chosen to assess the impact of the programme. The baseline survey of this project has been conducted where about 3500 households have been surveyed. RBM in Livestock and Agricultural Unit: PKSF has established the Livestock Unit (LU) and “Agriculture Unit” in 2013 as per 182nd board meeting decision. The goal of Livestock Unit is to ensure sustainable livestock production toward poverty alleviation through sustainable development of the poor and ultra-poor using micro credit as a means andthat of Agriculture Unit is to enable the farmers to gain access to resources necessary for agricultural production, employment generation and for enhancing the quality of their lives by undertaking agricultural activities. To assess the impact of these programmes, a plan has been undertaken to monitor impact on the programme participants. In this regard, around 500 to 600 households will be surveyed to implement RBM.